Our school is located on a spacious elevated site near Milltown village. The school consists of 3 large classrooms, a Staff-room, library and Kitchenette. The School was built in 1988 and opened on March 1st, 1989. It can accommodate 80 pupils in three classrooms. There is also a library, kitchenette and staffroom. It has a handball alley, football field, basketball court, a large Tarmac playing area and play-shed/changing rooms. 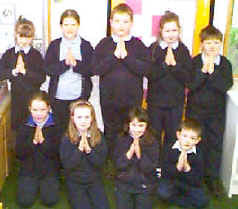 At present there are 55 pupils on roll. In addition to the three teachers the school has access to a resource teacher, Mrs Masterson of Cavan, whom the school shares with three other local schools: Scoi Bhríde Killashandra (Base school), Killashandra No. 2 school and Corless National School. Nuala Corrigan (nee Magee) is a native of Drumlane, being born in Staghall. After qualifying in Carysfort College of further education Blackrock, she taught in St.Maria Goretti Girls N.S, Donybrook, Dublin, and Ballinagh N.S Co.Cavan, before joining ths staff of Milltown N.S in 1988. Eileen Mc Caffrey is a native of Ballyconnell and has taught in London, Blackpitts, Dublin and Mountnugent. She joined the staff of Milltown N.S in 1982. Philip Clarke, School Principal, is a native of Ballymachugh. Having qualified (B.A H.DIP ED) from Maynooth College and St. Patrick's College Drumcondra, he was appointed to the teaching staff of SS Peter and Paul's N.S Balbriggan. Subsequently, he was made Principal at Milltown N.S in April 1981. Patricia Masterson is our Resource Teacher . A native of Co. Tyrone she now resides with her husband and family in Cavan. Her base school is Killeshandra No.1 N.S and she also serves Corlis and Killeshandra No.2 N.S. 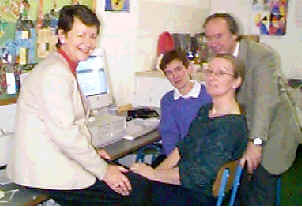 The school caretaker is Mrs Helen McVeigh, Derryvackney. Treasurer Dermot OConnor. Members: Mrs Eithne OReilly, Mrs Evelyn Cosgrove, Mrs. Una Brady, Mr Peter McGuire, Mrs Eileen McCaffery. While it acknowledges the importance of academic excellence it strives to contribute to all aspects of each pupil's development - spiritual, emotional, social, cultural, creative and moral. It endeavours to foster attitudes and skills to enable a positive use of leisure time now and later. The school recognises the important role of parents and clergy in the development of the pupils and it welcomes them as partners in achieving what is best for all pupils. To provide a warm, caring and stimulating environment in which the child will feel welcome and respected. Encourage children to respect themselves and others. Encourage creativity through music, drama and art. Encourage the child to participate in wholesome recreational activities e.g football, basketball, handball, and training / PE activities. Plan activities to allow children to develop desirable patterns of social behaviour. Where possible to ensure that children reach their maximum potential in all desirable areas of experience. To promote the development of self-discipline and to recognise the uniqueness of each child and help him/her develop worthwhile relationships with others around them. - Bill Gates Watch Out! The school opens at 9.05 am and finishes at 2.45 pm. There is a morning break from 11.am to 11.10 am and lunch is from 12.30 pm to 1.05pm. Handball Cumann na Meanscoil winners 1997 and 1998. Presently we have a three walled alley which is used full time by students. We also use the school sidewall as a court. Each year we run class leagues for girls and boys and coach them in the skills of handball. We participate in Cumann na mBurscoil handball leagues and also the inter schools handball leagues. 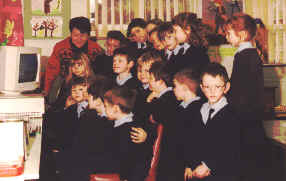 Our school was Cumann na mBunscoil County winners in 1997 and in 1998. The boys from our school won the Cumann na mBunscoil doubles and singles finals in 1999. Uniquely among Irish Gaelic Games, handball has a thriving international dimension, being played in the United States, Canada, Australia, Mexico, Spain and other parts of Europe. World and European championships are now staged. One of handball's great appeals is that it can be played to middle age and beyond. Many middle-aged or elderly people use it as a pastime and as a way to stay fit and healthy. Competitions for the most energetically minded mature adults are now played annually in Ireland. Today, boosted by modern facilities, better organisation, increased media interest and its international dimension, handball is a very competitive sport in Ireland. The magnificent new indoor facilities, in which all competitions now take place, has attracted more players, male and female, and the game is in a very healthy state. The simple technique of making the back wall in the enclosed courts a see-through one with a glass panel has proven to be a great success, attracting spectators who can sit in comfort in sports centres, watching competitors in action. Its future as a national and international game is well secure. Football  We have a football pitch at the back of the school where we do football coaching/ football leagues. Children, both boys and girls, really enjoy the game and this serves as a starting point for getting them involved in football locally and developing their interest in the sport nationally. 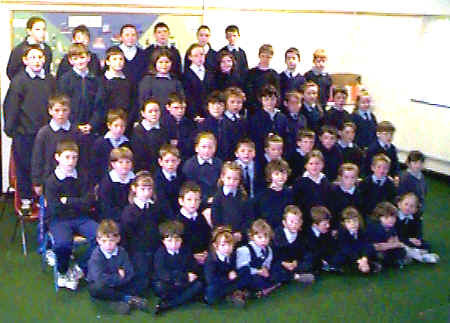 Many of our children represent Drumlane at club level. A G.A.A. 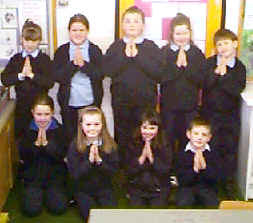 coach, Mr Ray McHugh, Templeport, visits the school weekly. The school participates in the C.N.M. league every year (girls and boys). There is also an annual sports day. Swimming  The children attend Cavan swimming pool every week. Every Summer they attend Arden Lake for Water Safety for two weeks.  Every year the children participate in the cross-border Opera Ireland project. Workshops are held regularly in Drama, Creative Writing, Music and Art under the auspices of Cavan County Arts Officer Catriona OReilly. 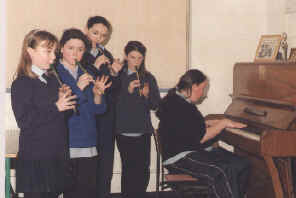 Music  Children from the school have taken part in Scor, Slogadh, Fleadhanna cheoil, school concerts etc. For a long time now children from our school have represented their club Drumlane at Junior Scor. Over the years they have participated in all categories and won the county final in the Traditional Music and Ballad Group section. Competitors, Boys and Girls, from Arva, Coronea and Milltown National Schools competed in the County finals at Milltown on Wednesday 19th May last. All Schools participated in Boys and Girls doubles and singles competitions. A notable feature of the competition was the high standard displayed by all competitors despite the fact that many of these children still play and practise their handball using one-walled alleys. Cumann Na mBunscoil County Coordinator Philip Clarke presented medals to winners and runners-up in all categories. It is envisaged, in the near future, to redesign the three-walled handball court at Milltown N.S and include a back wall, roof and other facilities to cater for the growing interest in the sport.